Papers will be particularly competitive if they 1) demonstrate effective use of sociological theories of race and ethnicity intersecting with and shaping rural contexts and/or 2) position race and ethnicity as a central theme of the paper. Submissions for the Student Paper Competition can be under initial review at a peer-reviewed journal but cannot be already accepted (in press) or published in a peer-reviewed journal. Double submission (paper cannot be submitted in any other RIG paper competitions) will disqualify participation. The winner(s) will receive a certificate of recognition. 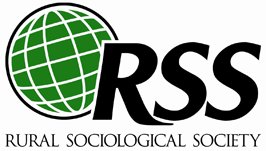 Author/s must be able to present the paper at the RSS Annual Meeting in 2019. The award will be presented during the Rural Race and Ethnicity Business Meeting at the 2019 conference. RIG co-chairs: Araceli González and Kevin Alejandrez.